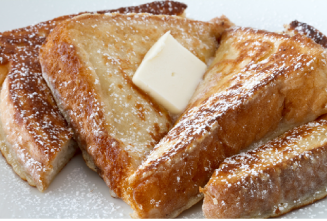 Classic french toast made with creamy J.R. Watkins Egg Nog. Combine eggs, egg nog, brown sugar, cinnamon, nutmeg, and flour into a shallow bowl. Whisk until all ingredients are well combined. Immerse both sides of the bread slices into the egg mixture. Preheat a large skillet or griddle to medium-high heat and spray with nonstick cooking spray. Place bread slices on the skillet or griddle and cook for a 2-3 minutes on each side, until golden brown. Serve with butter and syrup and finish with a powdered sugar dusting. *Also try with our other J.R. Watkins Egg Nog varieties like Vanilla and Vanilla Almond!